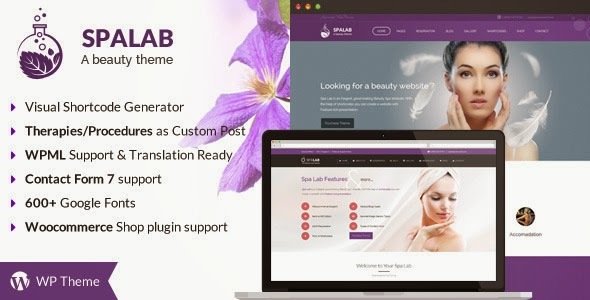 Spa Lab is a hand crafted Beauty Salon WordPress Theme for hair salons, wellness center, yoga / meditation classes and all other health care businesses. The theme includes essential advanced features such as two types of menu card designs, therapies, reservation, gift card, product and shop and many more… It has powerful theme options panel to brand your website with custom colors, logo, social links, contact info, product and service prices etc., Create gallery pages for treatments, spread news using blogs, capture leads with news letters and special gifts / Offers easily. Fully flexible and responsive WordPress Theme, works well on modern tablets and mobile phone, ipad. Item Reviewed: Spa Lab Beauty Salon WordPress Theme 9 out of 10 based on 10 ratings. 9 user reviews.